by Brianna Crandall — April 15, 2019 — Violence in workplaces across the country is a growing problem, with active shooter incidents too often reported at manufacturing plants, shopping centers, schools, night clubs, churches and many other places. No industry or location is without risk in today’s environment. The American Society of Safety Professionals (ASSP), considered the world’s oldest professional safety organization, recently took a new step to help curb the risk of workplace incidents involving active shooters and armed assailants. ASSP published a technical report — registered with the American National Standards Institute (ANSI) — that can help guide companies to safer environments and a coordinated response should a hostile event occur. The consensus-based document, How to Develop and Implement an Active Shooter/Armed Assailant Plan, contains recommendations from safety experts on how a business in any industry can better protect itself in advance of such an incident. The ASSP technical report is the collaborative work of more than 30 professionals experienced in law enforcement, industrial security and corporate safety compliance, aiming to drive a higher level of preparedness against workplace violence. ASSP points out that it has more than 38,000 members worldwide who are on the front lines of occupational safety and health, seeking solutions to complex issues such as this. In the safety profession, we manage risk for our organizations, so having the right tools is critical. 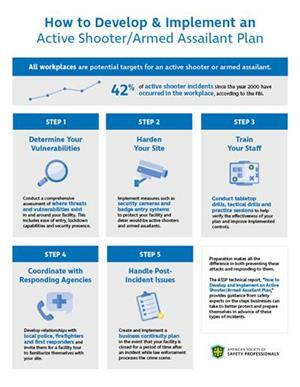 While no one can completely prepare for horrific acts of violence, smart workplace strategies can help mitigate threats and better protect workers everywhere. There can be deadly consequences to being unprepared. According to FBI data from the past two decades (2018 data not yet available), US active shooter scenarios reached an all-time high in 2017 with 30 incidents, up 50 percent from the previous year. Active shooter fatalities spiked in 2017 to 729, more than three times the nation’s previous high of 214 deaths in 2016. While the technical report can help any business create a safer climate, it’s especially beneficial to companies that don’t have the expertise to prepare for an armed assailant and are looking for a blueprint to assist them. The report is just what a safety manager needs to thoroughly assess risks and implement controls. A company’s safety preparedness hinges on a comprehensive assessment of where threats and vulnerabilities exist. Once a safety plan is developed, all staff must be trained. Exercises such as tabletop drills, tactical drills and full-scale practice sessions help to verify and further improve the implemented controls. Security cameras and badge entry systems also can help protect a facility and account for all employees during an emergency. It takes some work to be highly prepared for dangerous incidents, but the results are invaluable. You never know exactly what will happen, so practicing contingencies is key. We execute like we practice. According to the technical report, best safety practices include developing a relationship with local police officers and firefighters, asking for assistance where necessary. Invite first responders for facility tours so they learn the building’s layout and can offer tips on preventing intruders and improving emergency response. While random terrorist attacks can grab headlines, company leaders should know that acts of violence at their facilities would most likely be carried out by a disgruntled or terminated employee, a spouse of an employee, or a dissatisfied customer. Focusing on these possibilities helps safety managers better prepare their organizations. Employees must be trained to recognize potential threats and early warning signs and know how to report them. Once an armed assailant no longer poses a threat, the event still may not be over for the company. The technical report also recommends a business continuity plan because the worksite could be closed for a period of time. Visit the ASSP website to download the infographic above, view an introductory video for a new series of training videos, and learn more about the ASSP technical report, How to Develop and Implement an Active Shooter/Armed Assailant Plan. See also on FMLink: “SPECIAL REPORT: Active shooters — Facility preparation and training recommendations for FMs; A special report from FMLink to reduce mass shooting incidents and minimize their tragic losses” by Peter S. Kimmel, IFMA Fellow, publisher of FMLink.